- WCW Fall Brawl '00 = Kwee Wee lost to the WCW Cruiserweight Champion, Elix Skipper. - WCW Millenium Final (November 16, '00) = Kwee Wee competed in a Battle Royale, which was won by Mike Awesome. Later in the night, Kwee Wee won over Elix Skipper. - WCW Mayhem '00 = Kwee Wee was beaten by the Cruiserweight Champion, Mike Sanders. - WCW Greed (March '01) = Kwee Wee fell to Jason Jett. - HWA Batavia Show (August 25, '01) = Kwee Wee beat Alex Pettu. - HWA Cincinnati Show (August 28, '01) = Kwee Wee fought to a No-Contest with Johnny the Bull. - HWA Covington Show (August 30, '01) = Kwee Wee, Lash LeRoux & Reno fell to Steve Bradley & the Island Boys. - HWA Cincinnati Show (September 4, '01) = Kwee Wee, Lash LeRoux, Shannon Moore, Evan Karagias, Jason Jett & Jamie Knoble won a "HWA vs. WCW" Match over Lance Cade, Cody Hawk, Pepper Parks, Matt Stryker & the Jablonskis. - HWA Dayton Show (November 14, '01) = Kwee Wee, Brian Adams & Haku were beaten by Val Venis, Steve Blackman & Tony B. - HWA Cincinnati Show (December 4, '01) = The Funkster won, via DQ, over Jamie Noble. - HWA Dayton Show (December 8, '01) = The Funkster, Maven & the Ice Cream Man took down Time Bomb, the Yangster & the Great Hayashi. - HWA Cincinnati Show (December 11, '01) = The Funkster & the Ice Cream Man beat Scott Harper & Reno. - WWA Revolution (February 23, '02) = The Funkster defeated Reno. 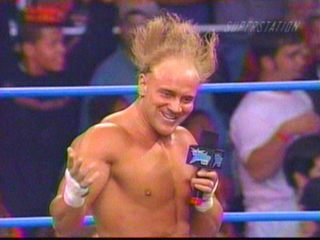 - WWA Eruption (April 13, '02) = The Funkster won over Pierre Oulette. - NWA-TNA Huntsville PPV (Show #1, June 19, '02) = Bruce competed in the "Gauntlet For The Gold" Match, which was won by Ken Shamrock. - NWA-TNA Huntsville PPV (Show #2, June 19, '02) = Bruce & Lenny Lane were beaten by Chris Harris & James Storm. - NWA-TNA Nashville PPV (Show #3, July 3, '02) = Bruce & Lenny Lane took down Buff Bagwell & Gran Apolo. Later in the night, Bruce & Lane lost to Jerry Lynn & AJ Styles, who won the vacant NWA-TNA Tag Titles. - NWA-TNA Nashville PPV (Show #7, July 31, '02) = Bruce challenged and beat Taylor Vaughn to become Miss TNA. - NWA-TNA Nashville PPV (Show #8, August 7, '02) = Bruce defended his Miss TNA Title, winning over Taylor Vaughn. - NWA-TNA PPV (Show #9, August 14, '02) = Bruce retained the Miss TNA Title, beating Tina Hamilton. - NWA-TNA PPV (Show #11, August 21, '02) = Bruce stayed Miss TNA, winning over April Hunter. - NWA-TNA PPV (Show #12, September 18, '02) = Bruce kept the Miss TNA Title, pinning a female fan. - NWA-TNA PPV (Show #16, October 16, '02) = Bruce & Jeff Jarrett fell to BG James & Hermie Sadler. - NWA-TNA PPV (Show #18, October 30, '02) = Bruce & Ace Steel defeated Jorge Estrada & Priscilla. - NWA-TNA PPV (Show #19, November 6, '02) = Bruce lost, via Countout, to Jorge Estrada. Bruce kept the Women's Title. - NWA-TNA PPV (Show #20, November 13, '02) = The Rainbow Express (Bruce & Lenny Lane) were beaten by the Spanish Announce Team.